Disney and Square Enix debuted new Kingdom Hearts 3 details at this year’s D23 conference. That includes a new trailer, above, as well as a brand new world featured in the PlayStation 4 and Xbox One game. The presentation kicked off with Kingdom Hearts 3’s E3 2017 trailer, which gave us our first fresh look at the game in some time when Square Enix premiered it in June. Director Tetsuya Nomura then arrived to help introduce the new content during Disney’s gaming-focused panel, streamed live this afternoon. A trailer showed our hero, Sora, taking on various Heartless in an action-packed montage. But the action soon faded out to a much slower-paced scene: Sora, Donald and Goofy arriving in the world of Toy Story. Buzz Lightyear and Woody helped explain the Heartless problem plaguing Andy’s bedroom, joined by other toys like Hamm the piggy bank and Rex the dinosaur. 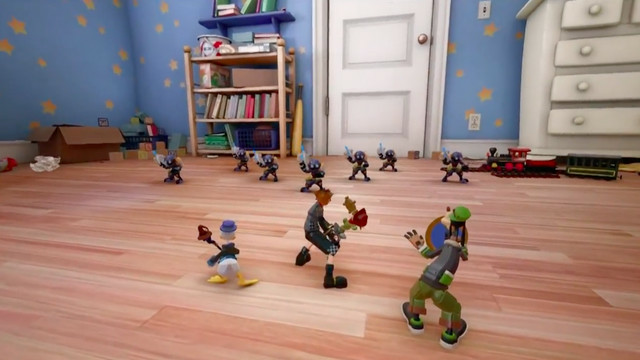 They later ventured just outside of the home to take on toy-sized Heartless — and even visited a toy store, where Sora got to jump into a mech action figure for a different kind of combat. We even get a brief appearance from Organization XIII, the primary antagonists of the game. The whole scenario will feature an original story set in the Toy Story universe, as members of the team from Pixar explained during the panel. Even John Lasseter, head of the animation studio, got involved with the film’s Kingdom Hearts debut. This marks Pixar’s introduction into the Disney-crossover series. Disney officially purchased Pixar in 2006, just after the release of our last mainline Kingdom Hearts game. Whether Toy Story will be joined by other Pixar classics remains unannounced, but Pixar’s first feature film is an excellent choice for the Kingdom Hearts franchise as it is. Other new worlds in Kingdom Hearts 3 include those inspired by Big Hero 6 and Tangled, two much more recent Disney animated features. Square Enix announced the Big Hero 6 world two years ago, during 2015’s D23 event. Kingdom Hearts 3 will launch in 2018.